Radiofrequency ablation RFA) is a minimally invasive procedure used to destroy abnormal or damaged tissue. The abnormal tissue is destroyed using heat (radiofrequency), extreme cold (cryoablation), chemical or laser. 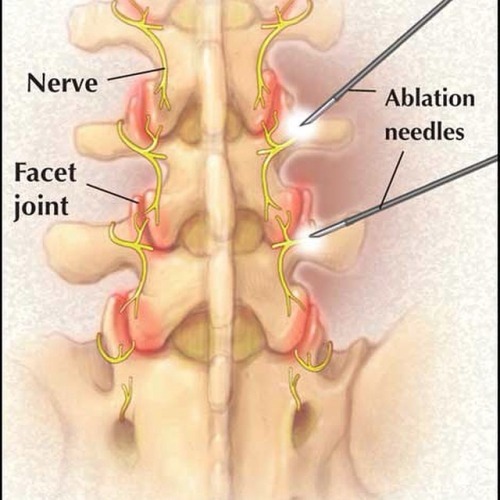 Radiofrequency-ablation uses heat to damage the nerves that send pain signals to the brain. This results in 6 – 12 months of pain relief. In some cases, relief can last for a number of years. RFA has been an effective treatment for some forms of pain and is well-tolerated. There are a few complications. The procedure is done with local anesthesia. Patients are awake during the procedure so they can provide verbal feedback during the RFA treatment. X-ray is used as a guide so the needle is placed in the exact target area. An electrode is inserted through the needle to administer heat and destroy the tissue that is causing the pain.